^ Höppener JW, de Pagter-Holthuizen P, Geurts van Kessel AH, Jansen M, Kittur SD, Antonarakis SE, Lips CJ, Sussenbach JS. The human gene encoding insulin-like growth factor I is located on chromosome 12. Hum. Genet. 1985, 69 (2): 157–60. PMID 2982726. doi:10.1007/BF00293288. ^ Jansen M, van Schaik FM, Ricker AT, Bullock B, Woods DE, Gabbay KH, Nussbaum AL, Sussenbach JS, Van den Brande JL. Sequence of cDNA encoding human insulin-like growth factor I precursor. Nature. 1983, 306 (5943): 609–11. PMID 6358902. doi:10.1038/306609a0. ^ Salmon WD, Daughaday WH. A hormonally controlled serum factor which stimulates sulfate incorporation by cartilage in vitro. J Lab Clin Med. 1957, 49 (6): 825–36. PMID 13429201. ^ Keating GM. Mecasermin. BioDrugs. 2008, 22 (3): 177–88. PMID 18481900. doi:10.2165/00063030-200822030-00004. ^ Rinderknecht E, Humbel RE. 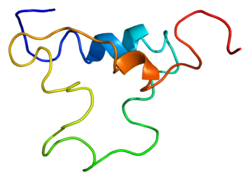 The amino acid sequence of human insulin-like growth factor I and its structural homology with proinsulin. J Biol Chem. 1978, 253 (8): 2769–2776. PMID 632300. Butler AA, Yakar S, LeRoith D. Insulin-like growth factor-I: compartmentalization within the somatotropic axis?. News Physiol. Sci. 2002, 17: 82–5. PMID 11909998. Maccario M, Tassone F, Grottoli S, Rossetto R, Gauna C, Ghigo E. Neuroendocrine and metabolic determinants of the adaptation of GH/IGF-I axis to obesity. Ann. Endocrinol. (Paris). 2002, 63 (2 Pt 1): 140–4. PMID 11994678. Camacho-Hübner C, Woods KA, Clark AJ, Savage MO. Insulin-like growth factor (IGF)-I gene deletion. Reviews in endocrine & metabolic disorders. 2003, 3 (4): 357–61. PMID 12424437. doi:10.1023/A:1020957809082. Dantzer B, Swanson EM. Mediation of vertebrate life histories via insulin-like growth factor-1. Biological Reviews. 2012, 87 (2): 414–429. PMID 21981025. doi:10.1111/j.1469-185X.2011.00204.x. Trojan LA, Kopinski P, Wei MX, Ly A, Glogowska A, Czarny J, Shevelev A, Przewlocki R, Henin D, Trojan J. IGF-I: from diagnostic to triple-helix gene therapy of solid tumors. Acta Biochim. Pol. 2004, 49 (4): 979–90. PMID 12545204. Winn N, Paul A, Musaró A, Rosenthal N. Insulin-like growth factor isoforms in skeletal muscle aging, regeneration, and disease. Cold Spring Harb. Symp. Quant. Biol. 2003, 67: 507–18. PMID 12858577. doi:10.1101/sqb.2002.67.507. Delafontaine P, Song YH, Li Y. Expression, regulation, and function of IGF-1, IGF-1R, and IGF-1 binding proteins in blood vessels. Arterioscler. Thromb. Vasc. Biol. 2005, 24 (3): 435–44. PMID 14604834. doi:10.1161/01.ATV.0000105902.89459.09. Trejo JL, Carro E, Garcia-Galloway E, Torres-Aleman I. Role of insulin-like growth factor I signaling in neurodegenerative diseases. J. Mol. Med. 2004, 82 (3): 156–62. PMID 14647921. doi:10.1007/s00109-003-0499-7. Rabinovsky ED. The multifunctional role of IGF-1 in peripheral nerve regeneration. Neurol. Res. 2004, 26 (2): 204–10. PMID 15072640. doi:10.1179/016164104225013851. Rincon M, Muzumdar R, Atzmon G, Barzilai N. The paradox of the insulin/IGF-1 signaling pathway in longevity. Mech. Ageing Dev. 2005, 125 (6): 397–403. PMID 15272501. doi:10.1016/j.mad.2004.03.006. Conti E, Carrozza C, Capoluongo E, Volpe M, Crea F, Zuppi C, Andreotti F. Insulin-like growth factor-1 as a vascular protective factor. Circulation. 2005, 110 (15): 2260–5. PMID 15477425. doi:10.1161/01.CIR.0000144309.87183.FB. Wood AW, Duan C, Bern HA. Insulin-like growth factor signaling in fish. Int. Rev. Cytol. International Review of Cytology. 2005, 243: 215–85. ISBN 9780123646477. PMID 15797461. doi:10.1016/S0074-7696(05)43004-1. Sandhu MS. Insulin-like growth factor-I and risk of type 2 diabetes and coronary heart disease: molecular epidemiology. Endocrine development. Endocrine Development. 2005, 9: 44–54. ISBN 3-8055-7926-8. PMID 15879687. doi:10.1159/000085755. Ye P, D'Ercole AJ. Insulin-like growth factor actions during development of neural stem cells and progenitors in the central nervous system. J. Neurosci. Res. 2006, 83 (1): 1–6. PMID 16294334. doi:10.1002/jnr.20688. Gómez JM. The role of insulin-like growth factor I components in the regulation of vitamin D. Current pharmaceutical biotechnology. 2006, 7 (2): 125–32. PMID 16724947. doi:10.2174/138920106776597621. Federico G, Street ME, Maghnie M, Caruso-Nicoletti M, Loche S, Bertelloni S, Cianfarani S. Assessment of serum IGF-I concentrations in the diagnosis of isolated childhood-onset GH deficiency: a proposal of the Italian Society for Pediatric Endocrinology and Diabetes (SIEDP/ISPED). J. Endocrinol. Invest. 2006, 29 (8): 732–7. PMID 17033263. doi:10.1007/bf03344184. Zakula Z, Koricanac G, Putnikovic B, Markovic L, Isenovic ER. Regulation of the inducible nitric oxide synthase and sodium pump in type 1 diabetes. Med. Hypotheses. 2007, 69 (2): 302–6. PMID 17289286. doi:10.1016/j.mehy.2006.11.045. Trojan J, Cloix JF, Ardourel MY, Chatel M, Anthony DD. Insulin-like growth factor type I biology and targeting in malignant gliomas. Neuroscience. 2007, 145 (3): 795–811. PMID 17320297. doi:10.1016/j.neuroscience.2007.01.021. Venkatasubramanian G, Chittiprol S, Neelakantachar N, Naveen MN, Thirthall J, Gangadhar BN, Shetty KT. Insulin and insulin-like growth factor-1 abnormalities in antipsychotic-naive schizophrenia. Am J Psychiatry. October 2007, 164 (10): 1557–60. PMID 17898347. doi:10.1176/appi.ajp.2007.07020233.